Welcome back to the start of another exciting school year in Clinch County. We have many opportunities planned for parents and students to get involved and stay engaged this year. 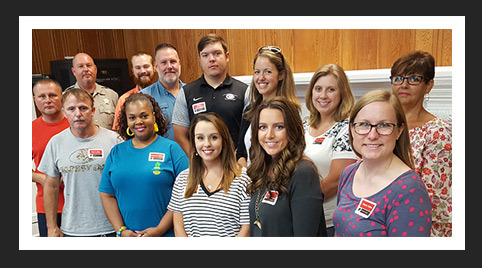 We started our year by welcoming new staff members as pictured below. We celebrated returning staff by recognizing years of service, as well as our building-level support staff and teachers of the year during our system-wide kick off. We invite you to view our photos from our July 30 event. We ended our morning breakfast with a message from Ms. Melonie Brown, recognized as our system-level teacher of the year! Congratulations to Ms. Melonie Brown for her 40 years of outstanding years of service. Fortunately, Ms. Brown has chosen to return to work at CCEMS as a part-time interventionist. You’re one-in-a-million, Ms. Brown! Our focus on instruction will be evident this year as we implement the exciting new Literacy for Learning, Living, and Leading in Georgia (L4GA) Grant, which includes initiatives for birth to five years old through 12th grade. We have local community partners, the Okefenokee Regional Education Service Agency (OKRESA) and a new reading curriculum called Journeys/Collections that are heavily embedded with evidence-based literacy strategies to improve literacy outcomes. This fall we will begin work on our next three-to five-year strategic plan. If you are interested in participating in committees that will drive our long-term academic, safety, or fiscal responsibility goals, stay tuned. Our co-chairs for this work are Ms. Marie White (CCEMS counselor) and Ms. Mary Catherine Hart (CCHS teacher). They are eager to begin gathering feedback and forming focus groups by mid-October. This spring we will host the AdvancED team who will determine our five-year system accreditation status. Information gathered through our strategic planning this fall will inform their work. We look forward to showcasing our school system’s progress in the areas of promoting students’ growth and achievement, maintaining safe and secure learning environments, and demonstrating sound fiscal practices. Please continue to monitor our system website and social media sites at your child’s school for updates throughout the year. Please view the entire superintendent's message for more information. It sounds obvious, but you would be surprised how many children miss more than five days of school each year. Illness and family emergencies cannot be avoided, but research suggests that children who miss two days of instruction the first month of school go on to miss an average of two days every month of the school year (BERC, July 2014). How can you help? Stress the importance of perfect attendance from the first day of school (other than for severe illness or doctor appointments that you cannot schedule outside of school hours). Most of our students rely on their parents to make sure they are at school every day. If they are not here, we cannot teach them – so please help us meet our goal of perfect attendance for 95% of our students during the first 20 days of school. Most of our students ‘read’ by third grade, meaning they can decode words at or near grade level. Unfortunately, simply decoding words is not sufficient for children to master the curriculum. We are fortunate to have some of the most trained experts for providing reading instruction right here in our Clinch County Schools, but students who struggle will look for ways to avoid attending. How can you help? First, make sure you child attends school every day. Then, talk to your child about what they read; talk to their teacher about what they should be able to read independently at home; and finally, sit down with them often to enjoy a good book. If they don’t want to read to you, read something yourself while they read independently or complete their homework. Nothing says you value reading like you reading something in front of your child daily. Learning is not restricted to the walls of our schools. Opportunities surround us daily. You are your child’s first (and forever) teacher. How can you make the most of every minute your child has to become college and career ready? No age is too early! Talk to your toddler as you work through daily decisions. Simply exposing your child to language before they can talk will help build their listening skills. Sharing time looking through something as simple as a weekly sale flyer from our local Harvey’s or Rite Aid helps them gain meaning from text. Making a list of the items you need to pick before you even leave the home demonstrates the value of writing and models organization. Helping young readers find the item listed by matching them to the pictures they saw in the sale flyer is a great pre-reading activity; and challenging mature readers during the selection process to recall details from what they read in the sale flyer can increase long and short-term memory. When making final decisions on what goes into your cart for purchase (if more than one option is available), talk about why you might choose one over the other. Mention specific reasons, such as cost and quality of items. Make sure to use advanced terms whenever possible, rather than ‘watering down’ your language to what your children would typically hear from their peers. It is never too early for children to benefit from exposure to the use of technical language in context. Your time and attention are your most valuable assets, so share them frequently!